COAST needs your help to move Ohio toward a strong and healthy economy. Please join us at our Greater Cincinnati Area-West phone bank at 3012 Glenmore Avenue and help us tell others why Issue 2 (upholding Senate Bill 5) and Issue 3 (the Health Care Freedom Amendment) are critical in moving Ohio forward and creating a brighter future for all of us. The phone bank is open now until the election. 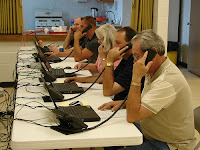 When: phone bank hours are Monday-Saturday 9-9 and Sunday 12-4. Questions: If you want to volunteer, but another time works better for you, or if you have questions or would prefer to make calls from home, please contact AFP-Ohio Field Coordinator Jason Gloyd at jason.gloyd@gmail.com. Issue 2 (to uphold Senate Bill 5) will help bring more accountability to government, give taxpayers a greater voice in how their tax dollars are spent, help us reign in government spending, avoid job-killing tax hikes that Ohioans just can't afford, and make Ohio more competitive for attracting much-needed jobs into the state. Issue 3 (the Health Care Freedom Amendment) is an amendment in response to the Federal Health Care Plan that mandates every Ohioan purchase health insurance. Issues 2 and 3 will be won by Ohioans talking with those in their communities about the importance of these issues. Please help us spread the word! The calls are dialed for you and you only have to ask a couple of quick questions, very easy and painless. Any time you can spare between now and the election would greatly appreciated. We are strongly against Issue 2. We want union leaders deciding how taxpayer money is spent, not our elected officials. NAACP and Smitherman do it again! Schmidt named one of Congress' "most corrupt"